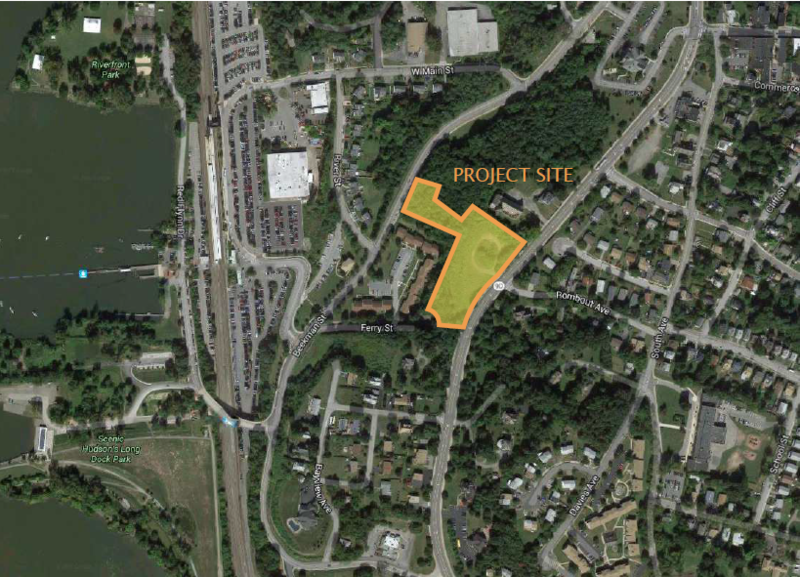 A goodly contingent from the newly formed Fishkill Landing Community Association appeared before the Beacon City Council on January 19th to argue against planned developments in the Linkage Zone. The group is petitioning the City to remove certain addresses from the Zone, including the Reformed Church of Beacon and rectory at 1113 Wolcott Avenue; the lot known as Parcel L, which is immediately south of the church; and 1085 Wolcott. The other properties are across Wolcott/9D, on South Avenue. They include St. Andrews Episcopal Church and rectory at 17 South Avenue and the former Martin Luther King Jr. Center at 21 South Street, both of which the diocese is interested in selling. The main focus last night was on Parcel L, which was purchased by the Unicorn Contracting Corporation of Cold Spring. 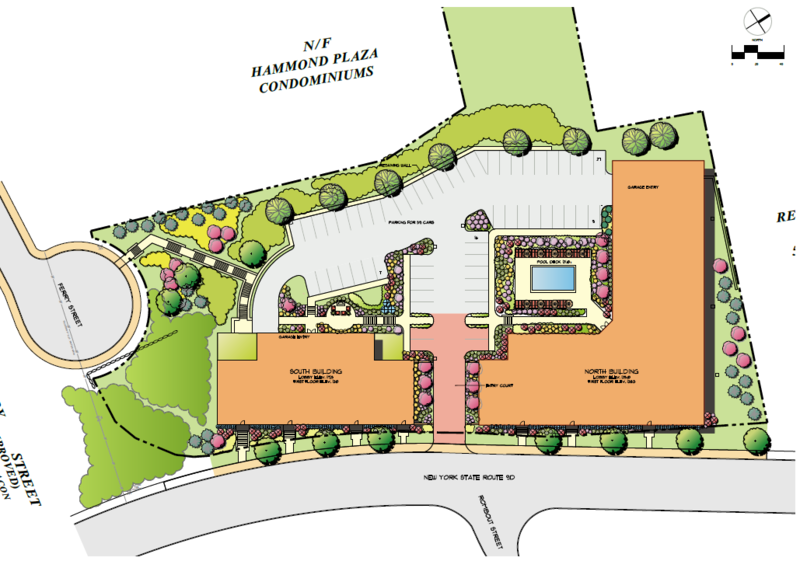 The current concept plan, River Highlands, first presented to the Beacon Planning Board this fall, calls for two large buildings with a total of 70-80 units, plus or minus. The entrance would be almost directly across from where Rombout Avenue enters 9D. 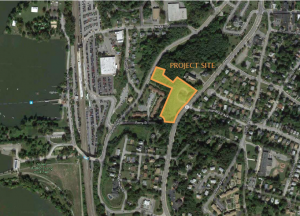 Parcel L is the site of the proposed apartment complex on 9D, adjacent to the Reformed Church of Beaqcon (originally the Reformed Dutch Church of Fishkill Landing) , designed by Frederick Clarke Withers. Each of the citizens who got up spoke clearly and calmly about the issues these proposed developments raise, for both the immediate neighborhood as well as the City at large. The history of the area was mentioned, including the destruction of much of it during urban renewal and, somewhat later, the widening of Park Avenue, aka Wolcott Avenue, aka 9D, some years later. Further history includes a group that, in 1994, successfully fought off a proposed 35-unit building on the same Parcel L back in 1994. It was said that 4-story, high density apartment complexes are out of place and oversized in a neighborhood of mostly single family homes. Of course, the perennial problems of traffic, parking, and infrastructure were mentioned as well. Before going any further, full disclosure: I was a member of the citizen committee that was tasked by the City to develop the code for both the Central Main Street district and the Linkage Zone. The committee consisted mainly of a previous committee that was formed by then mayor Steve Gold to look at what had happened down at the waterfront, and included people, including myself, who were involved with the creation of Beacon Deserves Better, a grass roots group that stopped the MetroNorth megacomplex at the train station. When Randy Casale became the new mayor, he asked the group to continue, but to table the riverfront work and focus on the CMS and Linkage areas. He also added new members, including several developers. Helping things along was a small grant that allowed a brief appearance or two by land use attorney and planning consultant Joel Russell. Now, no doubt Joel is very good at what he does, but I believe we got a bit of a boilerplate consult. Not that he is to blame; you get what you pay for. In the New Urbanism planning that Mr. Russel is a practitioner of, there is perhaps no greater darling than the word “density” Density is good because, well because it is the opposite of sprawl, and sprawl has been a blight on the land. When reacting to something that has proven detrimental, we sometimes overcompensate. We also tend to quickly lose the original meaning and intent of the word or phrase that embodies the “solution.” That is what happened with the TOD, or Transportation-Oriented Development that MetroNorth was selling down at the riverfront. Rather than a true mixed use development that promoted walking, working, leisure, and shopping, it was in reality a giant parking lot surrounded by apartment buildings, a build out which would have further cut off the City from the waterfront, with the parade of traffic funneling on and off 9D acting as a motorized moat between the City and the river. The plan as presented was more in keeping with Transit Adjacent Development–in other words, just big residential buildings plopped down next to a train station, but with few of the other key components of a TOD, such as jobs, a walkable environment, and retail. And so the words and phrases become so much hype for real estate brochures, developers, and planners. The notion that form will suddenly create a sense of place on 9D will not work unless the roadway itself is calmed. Density is tricky. There are two things that wreak havoc with the formulas: transportation and jobs. People need to shop for stuff and they need to get to work to make the money to shop for stuff (ain’t life grand!) Beacon is a small (okay, tiny) city that has neither a public transportation system nor anywhere near enough jobs for most of its citizens. Therefore, the great majority of residents get around by car. Therefore, density equals more traffic and less parking. 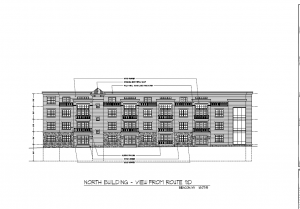 It is doubtful that the new residents of this complex will behave substantially differently from current residents: a few will walk to the train to get to work, a few will walk to Main to shop. Sadly the majority will likely proceed directly to their car almost every time they walk out their front door, even if they are only going a mile away or less. To partially address the parking and traffic conundrum, one regulation I tried to champion in the new zoning was to establish maximum parking requirements, rather than minimums. By restricting the number of parking spaces, you essentially put a cap on automobiles. Some municipalities do exactly that, putting a city-wide cap on the number of parking spaces within city limits. With individual buildings, the intent is to limit the scale, or force developers to get more creative in attracting buyers or tenants who don’t rely on a car for mobility. The problem here is, the developer needs to be held accountable. If you allow them, say, no spaces, and they rent or sell to people who have cars, those cars will become a public nuisance and take away public parking spaces, while also adding to the traffic problem. (Does the current clusterflooey surrounding the Beacon Theater ring a bell?) That’s why there needs to be a city-wide plan to control parking, and to charge for it. Unfortunately the idea of imposing parking maximums was considered too radical. In order to foster this compact (dense), walkable, environment, New Urbanism encourages mixed use, long a successful part of most organically built cities, but anathema to the suburban type zoning that separates everything by activity or use. Beacon is kind of a blend in this sense, with a long Main Street and industrial remnants that are within eminently walkable distance (or at least, walkable to our distant ancestors) from most of the homes, which are predominantly single family. Like many smaller cities and towns, it also adopted a suburban style zoning, oriented toward accommodating automobiles at all costs. High densities without ample public transport and jobs and retail mixed in results in traffic hell and further degrades the quality of life for all residents. In the linkage zone, one of the ideas was to try to recreate some of the old mixed use structures that joined the current Main Street with the riverfront. 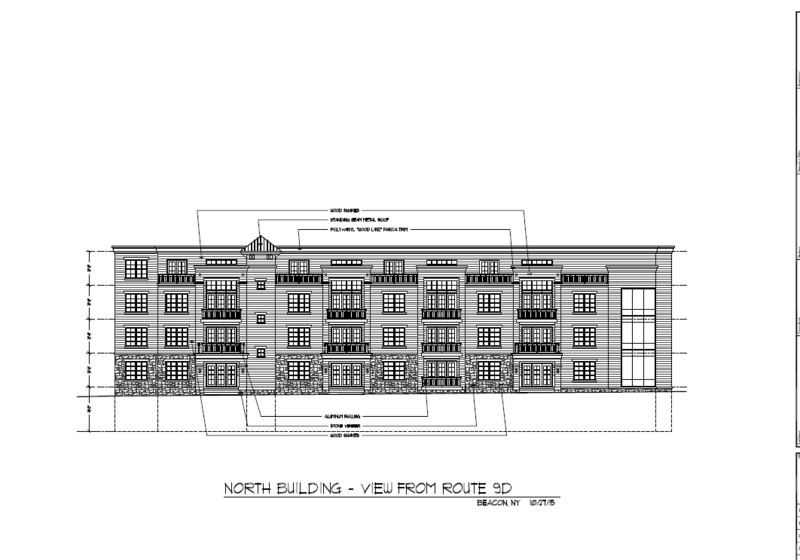 But ultimately the zoning in my opinion was too prohibitive of where and how this mixed use was to be developed. I believe this was in part due fear in the Main Street business community that it would invite undue competition. The default in the Linkage Zone is high density residential, with other uses requiring a special permit, etc. By not making mixed use mandatory anywhere except Main Street itself, the predictable result is that, all over the city, developers simply build as many residential units as they can within the parameters of the code—and beyond, with the able assistance of the know-nothing zoning board. Another tenet of New Urbanism is form-based codes, which rely on the actual physicality of spaces to create a sense of place, and encourage walkability, neighborliness, commerce.and aesthetic enjoyment. (Though most codes, including the one we developed for Beacon, are not purely form-based, but more of a hybrid. There goes the simplification) In any case, let’s face it, no matter what the setbacks or what facades or entry designs are used, the River Highlands will be “automotive scale,” not human scale. Unless 9D is significantly altered and calmed, these buildings will be seen mostly from the inside of a car traveling at 30mph. The zone revamping process itself became a bit of a death march toward the end, which was almost a full year of meeting almost every week. Although we took a couple of field trips, I think we could have benefited from more varied input. But the biggest problem is that whatever kind of code is used, it is a top down solution, and it highly favors developers, because we are fearful of making hard decisions. We want “growth” to “increase our tax base.” We want to sit back and wait for the developers to come a courtin’, do the the dance, complete with the outrage boogie, followed by oh well shuffle. And that too is part of Russel’s strategy–to streamline the process for the developers, make it very clear what we want. The Fishkill Landing Community Association is asking the city to reconsider the Linkage Zone parameters. Removing properties not on the boundaries would probably constitute spot zoning, which is not legal. One part of Russell’s process that was moderately successful in my opinion was engaging the public via several meetings, both before the process was begun and again before it was finalized into the city’s code. I’m not sure where the Fishkill Landing group was during this time, but the zoning has been public record now for a couple of years. And while it is very sweet to buy your house based on a couple of New York Times Beacon fluff jobs, becoming a concerned citizen only when your view gets disturbed or your back yard gets noisy with construction or you are worried about traffic pulling out of your driveway—well, let’s just say it doesn’t look quite the same as raising objections before the horse is out of the barn. I also don’t believe that reverting back to the old zoning on Parcel L, which would allow three large single family homes, is the answer. As for the zoning board of appeals, that crew has gone completely off the reservation, and is in fact wantonly destroying many of the safeguards and limits built into the codes. That said, the zoning is far from ideal. At the time it was unveiled, building inspector and code enforcer/interpreter Tim Dexter, like many others, felt the committee did a good job, but even the inspector said that it would need to be adjusted over time.Things are happening so rapidly now that there is barely time for the planning board to catch its breath. As for the zoning board of appeals, that crew has gone completely off the reservation, and is in fact wantonly destroying many of the safeguards and limits built into the codes. The city should consider a moratorium on all construction until it comes up with a viable city-wide plan to deal with the perennial bugaboos of traffic and parking. Inevitably, each of the various projects stumble over parking and/or traffic issues.The city should consider a moratorium on all construction until it comes up with a viable city-wide plan to deal with these two perennial bugaboos. And it would not involve building more parking lots. In addition to charging for parking, through permits and meters, It would involve enticing more small businesses, particularly small manufacturers, to the City, with preference and support to local and regional residents who own or would like to create such businesses, including existing businesses that might want to expand. It would also involve incentives for people to get out of their cars, or even give one up if they have two or more. How to begin healing the wound that is the Linkage Zone has baffled the City for 45 years, when poor planning in the name of progress and a better future destroyed our connection with the riverfront via urban renewal? Getting involved, even at the 11th hour, in trying to stop bad development, is better than not doing anything. But, as a city, we need much more than opposition. We need vision. The mayor can be impatient with the seemingly endless rounds of planning and committees and outreach, and I share some of the frustration, but we’ve waited 45 years now–what’s the rush? 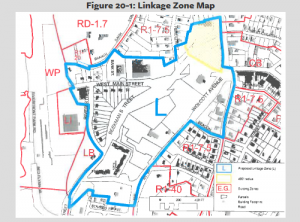 The purpose of [the Linkage Zone] is to increase the vitality, attractiveness and marketability of the part of the City of Beacon lying between Main Street and the Metro North Train Station (the “Linkage District”) by providing more residential development along with flexibility of land use, while enhancing urban form as recommended in the City of Beacon Comprehensive Plan adopted on December 17, 2007. The “attractiveness and marketability” in that sentence is addressed mainly toward developers and real estate “investors.” Laying open the city gates, as it were, and allowing developers to mold the future of the city. The more you do things a certain way, the harder it is to imagine doing them another way. Can we imagine a future for our city that does not put everything into the hands of developers and their agents? The Comprehensive Plan is supposed to be a living document, available at every city council meeting, and constantly updated. It is also supposed to receive a total going over every 5 years. The mayor is currently forming a committee to do just that. This is a good opportunity to help shape and create, rather than only react in opposition. Hopefully, there will be representation on this committee from groups like the Fishkill Landing Community Association. Although it is a valuable document with many excellent ideas, the Comprehensive Plan as it was envisioned in 2007 suffers from its complexity and many redundancies, as well as ideas that were probably outdated even when the document was fresh off the press. It is not as accessible as a document that is intended as a guide to direct the course of a city should be, and the path it set has only grown murkier. It may sound a bit hokey, but now more than ever, It’s time to work to create a clear vision of what Beacon can be like—needs to be like. One that takes into account some of the intractable problems we face both here and in the country and the world at large in that not too distant future; not just a story based simply on what worked or didn’t work yesterday. It should probably be a vision that is not based entirely on selling high-priced apartments to people from out of town. Rather unfortunately, this notion of working on a new paradigm for Beacon will likely not be a voluntary one before too long. And while a financial crisis and economic depression will, depending on when it descends in full force (a month, a year or two), likely leave many of these developments in various stages of completion, it will behoove us to at least have begun talking about what to do in their place, rather than walking into a complete vacuum. Full text of Linkage Zone code can be found here. 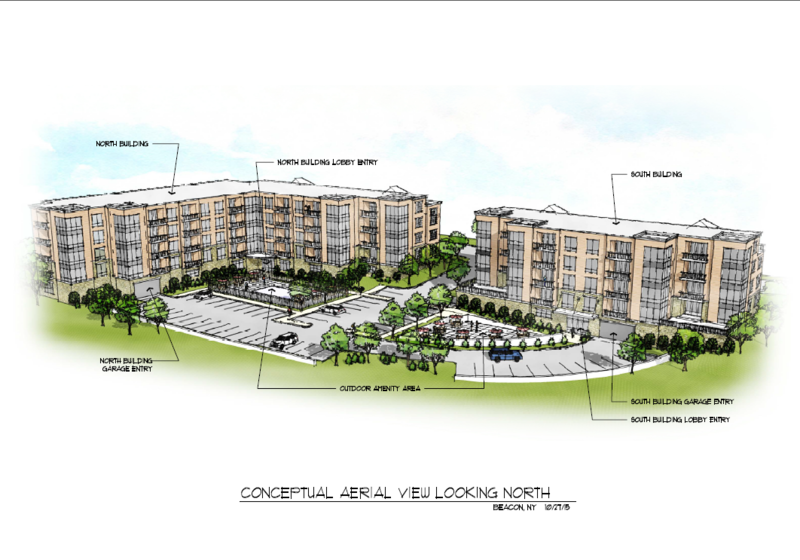 Coming soon: Wigwam’s Super Awesome Vision For Beacon! & Oil on the China, Etc. What I don’t understand is what supersedes what. That is, the lots in question are within the Historic Overlay, and those lots are within the ‘Medium Density’ regions of the comprehensive plan (p. 149). Does the Linkage Zone language trump those aspects? FYI – The City Council meeting tonight (5/2/2016) will include a Public Hearing on the issue. I am truly curious about the conflict of the Development scale+location with the Historic District Overlay and the medium density criteria of the Comprehensive plan, with respect to these lots. 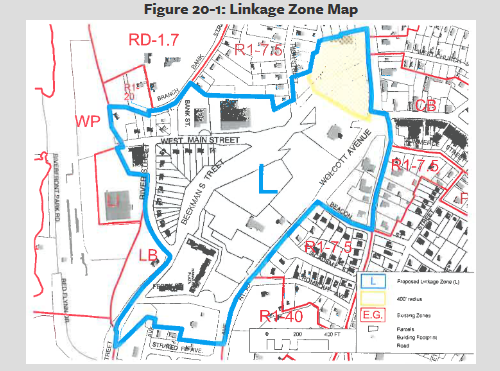 There is no mention that I see in the Linkage Zone wording that refers to the Historic District Overlay or to Density. I was under the impression that architecture in the Linkage zone was to somewhat emulate the Historic architecture of buildings on Main Street? Would you entertain the idea of informing your readership about this development? Thank you for this thoughtful analysis and for the interesting comments. It’s nearly impossible to create a well designed building with government involvement.Boards are formed with several appointed egocentric leaders looking to leave a legacy who have no training in the field.Look at the structures government led boards have given birth to in Beacon,Forrestal Heights,31 Eliza St., Tompkins Hose Fire House and most of all the Municipal Center.None of these have any an iota of architectural qualities that fit the city and most fail at functionality.The initial start to this problem began with government involvement called “Urban Renewal”. Someone’s name is on a plaque somewhere taking credit for that fiasco. Our plan now is to have more government involvement solve the problem. If you watch any board meeting you will see 1 or 2 individuals push their agenda through a process that leads to a unanimous decision. Hopefully one of these days one of those egotists will have some design sense . Odds are on our side. I agree 100 percent with your assessment of those municipal projects. You might add the Dutchess County/DMV building and the Verizon building. Urban Renewal was a great way for those in control to make money, because the federal government supplied funds to buy up “slums”, a term that was loosely defined, and within the power of the local authorities to determine. They could then make all kinds of sweetheart deals with friends and private developers. The problem today is also about gaming the system, though the rules are a little different, and government is only involved in the planning stage. There is no real sense of creating civic space; it’s all about maximizing the number of “doors” so that, as a private developer, your plan looks as enticing as possible to the banks. This leads to overscaled buildings and too much density for the context. And mixed use is only considered when absolutely required by code. This problem is aided and abetted by a very lax interpretation of the codes, and a zoning board of appeals that might better be known as Variances R Us. The Linkage district was designed and billed to “connect Main St to our waterfront.” That’s a laudable goal, one that I have fought for for over 20 years. But what in the world does erecting Main St style buildings –not connecting Main St to waterfront — but rather in the midst of historical single family homes in residential neighborhoods off the Main St corridor? If only the current design were a Main Street style building. That would be a significant improvement in both scale and design. Although I do believe the city would benefit from extending mixed use beyond the confines of the straight one mile drag strip of Main Street. This proposed complex does not accomplish that in any way. Wonderful article. I have lived below parcel L for 18 years. I participated for over two years with “Beacon deserves better”. It was a great experience as we collectively stopped the MTA and collaborated with our Main Street neighbors and many from all over Beacon. I admit, I did not follow the work of the LinkagesCommittee. I did not realize it encompassed all it does. I turned my energy to a project in Newburgh by joining the board for restorative justice. I was not asked nor were any of my neighbors in Hammond Plaza to get on the Linkages committee. We have learned now that we must always be represented and seek out information on all projects in Beacon. I have stepped down at the VP of our Hammond Plaza Board to focus my energy on how all the proposed developments will effect Beacon. The creation of our Community group (Fishkill Landing Community Association)has been to include all who are interested. We welcome concerned citizens and business owners to join with us in addressing the development issues around the city. We are not anti development, we are for well planned appropriate growth. Thus far we have members who have lived in Beacon for over 50 years to new neighbors. It is not a group only concmerned with their view or being below a monstrous development. We all want to be sure anything developed is done with great thought to the impacts on walk ability, environment, history, economic and cultural diversity as well as infrastructure capacity.